Today, Jesus meets some Sadducees who try to trip Him up with a Bible question. Does it work? When we know this background, we can see that the question the Sadducees put to Jesus was an attempt to trap Him in a contradiction of Moses, the author of the Pentateuch. 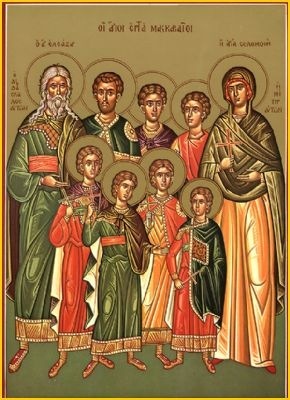 If there were such a thing as resurrection, they proposed, there would be terrible confusion over whose wife the childless woman, instructed by Mosaic law to marry the brothers of her dead husbands, would be. What mistake were the Sadducees making? Because they were certain that Moses did not explicitly teach about the afterlife, they were confident it did not exist. They hoped to expose the awkwardness and sheer irrationality of the doctrine of resurrection if Jesus tried to answer their question. In one breathtaking sweep, Jesus overturns all the Sadducees’ doctrinal objections. With wonderful clarity, He gives us a window into the life of the world to come—a world in which death has been conquered and life never ends. A trap turns into a remarkably beautiful teaching from Jesus. Isn’t that just like Him? Possible response: Lord Jesus, thank You for making the impossible—life beyond death—possible. Here we have another reading about seven brothers, although these men were not all marrying the same woman. They were facing martyrdom for refusing to violate the Jewish prohibition against eating pork being pressed on them by the pagan king who ruled over Judah at that time. The brothers were “ready to die rather than transgress the laws” of their ancestors. Where did they get such courage? When the fourth brother was near death, he confessed his belief that his steadfastness in faith would be rewarded by God, but he warned his persecutors that “for you, there will be no resurrection to life.” We can see here many of the beliefs about the afterlife that were taken up in Jesus’ response to the Sadducees in our Gospel. A doctrine of personal, bodily resurrection after a life of faithfulness was slow to develop for the Jews, but by the time of the Maccabees, several hundred years before Jesus appeared, it was well established. Jesus thought the Sadducees should have taken their cue from Moses at the burning bush, which happened about 1500 years before Jesus. To know this life is not an end in itself but a preparation for the life to come means that we will, paradoxically, live this life much better, no matter what we face, even martyrdom. Possible response: Lord Jesus, help me make decisions in this life with the confidence these brothers had that life here isn’t an end in itself. If we are thinking now about the resurrection as a reward for those who are “deemed worthy” of it, as Jesus says in the Gospel, we might start to get nervous. We know ourselves; we know that we have faltered and failed, been fickle and indifferent, have not always zealously pursued righteousness. What about us? We can hope for our own resurrection when we put all our hope in Jesus and doing what the Lord instructs us to do. He will bring us safely home. Possible response: Heavenly Father, I thank You that my confidence in life after death comes from Your great love for me and the promise of Your help to attain it.